I received a call to cater a women’s health event recently. How could I say no to an opportunity to whip up healthy delicious food for a group that would totally appreciate it? 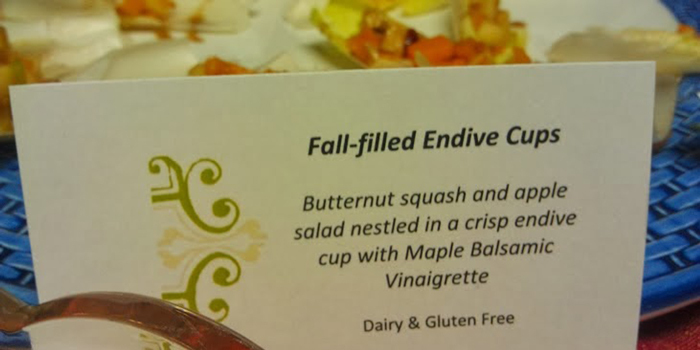 This fall-filled endive cup was the hit of the night! For the event I used endive cups (see the images at the bottom of this page); you can see I used kale leaves for these photos (butter lettuce would work really well too). Kale is NOT for everyone so go with what you like. You could even toss this with lettuce or spinach and serve as a side salad (would be perfect on your Thanksgiving table). 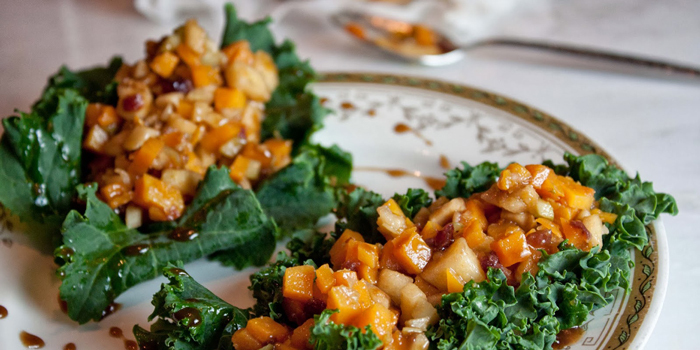 Roasted butternut squash pairs so well with fresh apple. 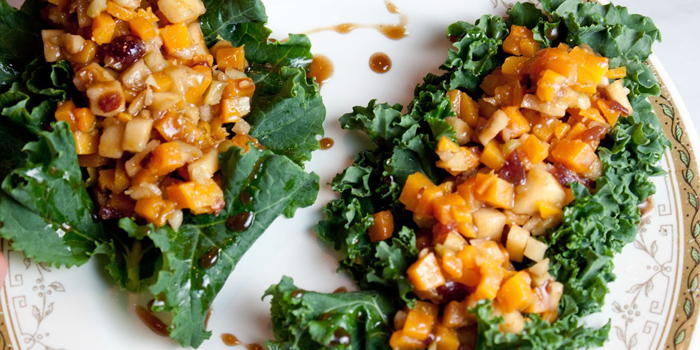 The maple balsamic dressing screams warm fall flavors with a breeze of sweetness. Since maple syrup is derived from nature, it offers nutrients like iron, calcium and zinc with fewer calories than refined sugar which is void of any nutritional content. Maple syrup also has a low glycemic index making it ideal for those with diabetes. Try these super yummy Fat and Happy squash and apple filled lettuce cups, it’s a healthy way to enjoy the fall goods. Heat the oven to 400 degrees. Toss diced squash with olive oil, spread out on a cookie sheet and roast until just fork tender. Depending on your oven and the size of the dice, this should only take 10-20 minutes. Keep a close eye on them to avoid getting too mushy. Remove from oven and cool. Toss the roasted squash, apple, onion, celery and cherries together with about half of the dressing. Spoon the salad mixture into the lettuce leaves, and then drizzle with a bit more of the maple balsamic dressing (you may not need all of the dressing. Add to your liking).. Sprinkle with pepita seeds if using. Taste and adjust to your liking. Add a little more maple syrup if you like it sweeter or additional mustard for a bit more tang.